From the "Paris of the East" in Bucharest, Romania, to the "Golden City" of Prague, in the Czech Republic, this Danube river cruise is an odyssey of new discoveries to treasure. Begin in Bucharest for a tour of the capital’s boulevards, Arc de Triomphe, Royal Palace Square, and historic sites from a dramatic history. You’ll sail overnight to St. Gheorghe for an excursion to the Danube Delta at the entrance to the Black Sea. Join a small-boat guided tour of the delta’s rivers, canals, and marshes. Enjoy a special "Kilometer 0" celebration of the mighty Danube’s 2,845km journey from the Black Forest to the Black Sea. Begin in Budapest, where guided sightseeing includes Heroes’ Square, and make a visit to Gödöllö royal palace, beloved by Sissi. Set sail on the Danube, take pictures of the impressive Parliament Building as you leave Budapest, and head for Bratislava, the capital of Slovakia. Vienna, Austria, once center of the Habsburg Empire, is home to the lavish Habsburg Imperial Palace and neo-renaissance Vienna Opera House. Enjoy the magnificent views of the Wachau Valley wine region, visit Melk’s magnificent Benedictine Abbey, and sample local wines. In Linz, walk around the Hauptplatz, Austria’s largest medieval square, which forms the center of the city or take an excursion to the Austrian lake region, visited by the Habsburg family. 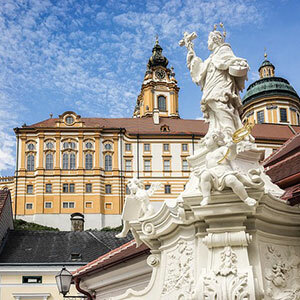 Take a guided walk of Passau, Germany, known for its maze of cobblestone streets and St. Stephen’s Cathedral-a masterpiece of baroque architecture. Guided sightseeing in Regensburg, Germany, shows you the Old Town Hall, Porta Pretoria-gates to an ancient Roman fort built in 179 AD-and mansion towers. In beautiful Prague, capital of the Czech Republic you’ll be amazed at St. Vitus Cathedral and Old Town’s Astronomical Clock. End your vacation with two special nights in Berlin!